The most intriguing aspect of Cormac McCarthy's writing is the irresistible premonition that his sentences carry an exceptional potential, that after each subsequent reading they surprise us with increasingly deeper layers of meaning, which are often in complete contradiction to the readers' initial intuitions. His novels belong to the kind that we dream about at night, that follow us and do not let themselves be forgotten.Cormac McCarthy's prose has been read in the light of a variety of theories, ranging from Marxist criticism, the pastoral tradition, Gnostic theology, the revisionist approach to the American Western, to feminist and eco-critical methodology. 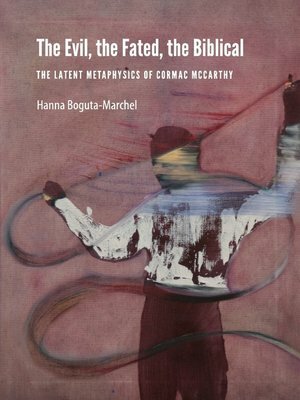 The perspective offered in The Evil, the Fated, the Biblical is an existentialist theological approach, which proposes a reading of McCarthy that focuses on the issue of evil and violence as it is dealt with in his novels. "Evil," unquestionably being a metaphysical category and, as a result, quite commonly pronounced passé, is a challenging and overwhelming topic, which nevertheless deeply concerns all of us. Boguta-Marchel's book is therefore an attempt to confront a theme that is an unpopular object of scholarly examination and, at the same time, a commonly shared experience in the everyday life of all human beings.The book follows the pattern of an increasingly in-depth analysis of the drama of evil that is omnipresent in McCarthy's books: from the level of the visual (grotesque images, hyperbolic depictions of violence, cinematic precision of matter-of-fact descriptions), through the level of events (circularity and repetitiveness of action, characters conceptualizing and enacting the struggle between predetermined fate and good will), to the level of the metaphysical (existential crises, grappling with the idea and the person of God, biblical allusions reappearing in the text). This way, The Evil, the Fated, the Biblical provides a complete picture of McCarthy's contest with one of the most troublesome issues that humanity has ever faced.